Some of the biggest names in music gathered for KIIS FM’s Wango Tango 2014 at the StubHub Center in California yesterday on May 10, 2014. Next up was A great Big World who introduced Christina Aguilera to the stage. She wore a black fitting dress showing off her baby bump and explaining her breathlessness was from sprinting to the stage. 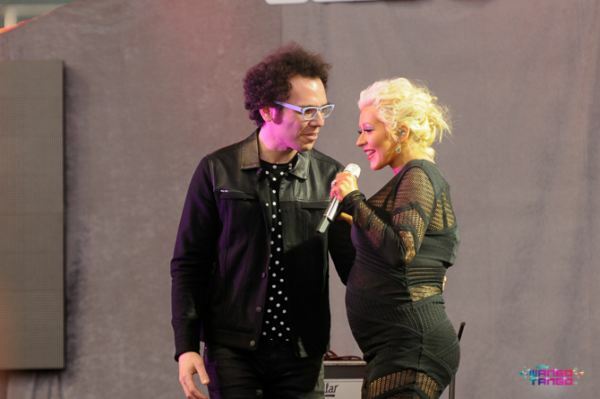 The pregnant pop star performed her duet of the popular ballad “Say Something” ending the set. Scottish DJ Calvin Harris, got the crowed waving their glow sticks to “Feel so close,” “I Need Your Love” and “Sweet Nothing” followed by Paramore with “Ain’t It fun?” and “Still Into You” and DJ Zedd’s “Clarity.” Columbian superstar, Shakira, rocked out exposing her bejeweled bra under a shredded tee with “Can’t Remember To Forget You,” current single “Empire” and “Hips Don’t Lie”. Ed Sheeran was next in a red flannel shirt and his acoustic guitar in hand. He performed “A Team” and his brand new single “Sing” off of his “X” album. EDM legend DJ Tiesto closed out the show to a sea of glow sticks raised by a jumping crowd dancing to the DJ’s remix of John Legend’s current single “All Of Me,” “Escape Me,” and “Red Lights.” Wango Tango was another epic event and we can’t wait for next year. Check out these photos which are featured on the KIIS FM web site and were taken by Andrew Hrera.